One of the best things about the internet is the plethora of instructional content. If you want to learn how to do just about anything, you can find a tutorial out there to teach you how. For me, tutorials have been absolutely essential to learning how to use Illustrator and Photoshop in particular. When someone asks me what books I recommend for learning the programs, I point them not to a book, but to online tutorials because you’ll learn much more quickly that way. 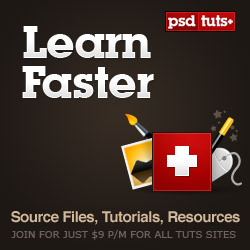 One of the best sites for tutorials these days is the Tuts+ network of sites. I am a long time fan of their content, so was pleased to be offered the opportunity to review their “Plus” program which offers premium conntet for a monthly fee of $9 (or $22 for 3 months). Access to source files – the free tutorials are great, but frequently I find that having the actual source file makes it much easier to put the tutorial to the best use. It makes it easy to copy layer styles and see exactly how the layers are set up, especially if you’re like me and tend to rush through and accidentally miss a step. Exclusive content – there are tutorials and sources files available only to Plus members, as well as brush sets and vector packs. The bonus Photoshop and Vector tutorials are great, but what I found to be of the most value were several of the Net tutorials. The series, “WordPress: Beginning to Master” is very good and even teaches how to create an options page for a theme. Affiliate program – I don’t get into affiliate programs much, and only mess with it if it’s something I feel offers real value to my readers. The Tuts+ program has a nice payout and is easy to recommend because the content is great. 1. The bonus tutorials are download only. There is no option to go through the tutorial online. Though I understand why they chose to set it up that way, I still would prefer the option of doing the tutorial online and only download it if I want to save it with the source file. 2. I wish the thumbnail preview images were a bit bigger on the bonus tutorials. It’s a little difficult to see what you’re going to be creating, and since the only way to really see the image to decide if you want to spend the time on the tutorial is to actually download the whole thing, it’s rather a hassle. I would suggest they make it possible to click on the thumbnail to see a larger preview image. There is a 100% money-back guarantee, so you can’t go wrong if you decide to give it a try. What do you think? Has anyone else tried the Tuts+ Plus Program?